The Logitech M585 is smarter than your average mouse. Logitech has made it multi-device compatible, and can be used with more than 1 device with Logitech Flow. The Logitech M585 is the typical fare from Logitech. It’s rather compact and has the bumps in the right places for an ergonomic fit, and has two additional navigation buttons on the sides. The 1000 DPI sensor is nothing exceptional. In fact, I think compared to other Logitech mice, such as the M280, the M585 looks rather boring. The key difference then, is the ability to work across multiple devices. 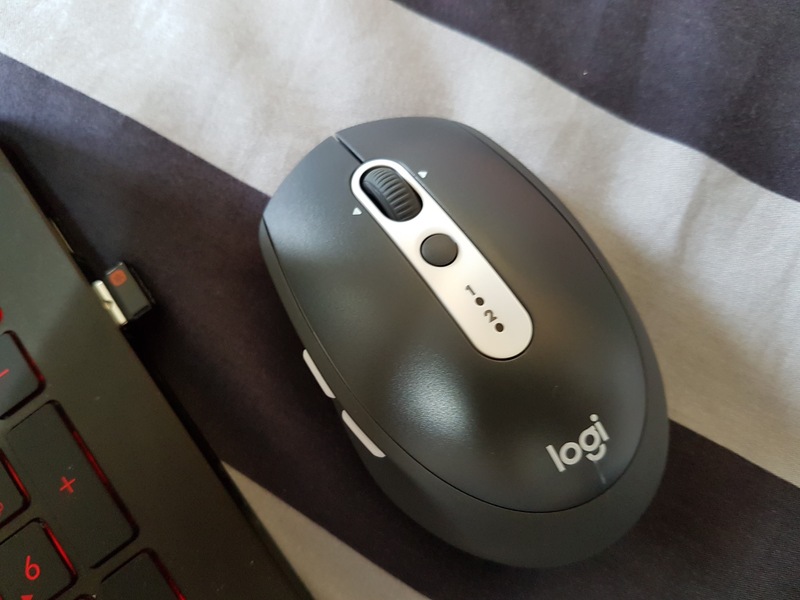 The mouse itself supports both the USB dongle setup (Logitech Unifying receiver) and Bluetooth connection. You can pair it with your Android or iOS devices too and manually toggle using the button below the scroll wheel. But if you are setting up between two computers, you can go one step better with Logitech Flow. Logitech Flow allows you to seamlessly transit from one device to another by automatically detecting your screen edges to transit control. However, in order to get a full seamless experience, you would probably need a compatible Logitech keyboard, which for now is limited to a few models. One thing to note, Logitech Flow implementation requires that the devices are individually paired to the two computers, and that they are on the same network. Logitech Flow not only offers control, it also allows you to copy and paste files easily between the two computers. One advantage I feel that Logitech Flow has over other software KVM implementations is the ability to use the computers independently, and also a better response time. What this means is: (1) improved productivity: You don’t need to switch to a different set of keyboard / mice for your other computers and (2) a neater desktop! Back to the mouse, it uses an invisible optic sensor so no bright red laser flashes, and the compatibility with different surface material is pretty high. The bulk of the mouse is covered in a textured rubber for a generally nice grip. The curved profile makes offers a nice relax grip. I felt the left and right click buttons used too much plastic, and were a little noisy in action. The scroll wheel is pretty good though. Each scroll level is indented, and yet, the wheel is very smooth, which allows for very precise scrolling. The M585 Mouse is sold exclusively online on Lazada through the Logitech Online exclusive store. There is an ongoing promotion for the M585 – 15% off! M585 for the whole month of October at only $41.65 (original price $49!). Shipping is free and also super fast. Silent clicks? This mouse has an interesting proposition. If you can’t stand the noise that your current mouse is making, you should check out the Logitech M590! Logitech has launched the all new M590 Multi-Device Silent Mouse. You can stay productive in silence with a highly versatile and customisable multi-device wireless mouse. Logitech FLOW: Seamlessly control multiple devices at the same time and even copy-paste content and documents between those computers. Enjoy the Sound of Silence: The mouse provides an over 90 percent noise reduction in click sounds with the same click feel and a rubber wheel for quiet gliding. Ultra-Precise Scrolling: A micro-precision scroll wheel packs more grooves per millimeter, making scrolling through long webpages faster and easier. Two Thumb Buttons: Two customisable thumb buttons come programmed to move backwards and forwards through Web pages but can be re-programmed to do exactly what you want them to. 24-Month Battery Life: This mouse just keeps going, with 24 months of power on a single AA battery. Automatic sleep mode and an On/Off switch save power, while an indicator light eliminates surprises. Looking for a great pair of wireless earbuds for your outdoor lifestyle? The Jaybird X3 now comes with enhanced sound, customisable audio options and an improved secure-fit, in its classic low profile design. The Jaybird X3 promises an enhanced sound experience with an improved 6mm driver this time around. Physically, the X3 is now smaller, making it the first in the X-Series to be helmet compatible. Multi-device pairing is also on the cards. You can now pair two sets of X3 headphones to one device and even pair your X3s to two devices simultaneously. The Logitech Create keyboard comes in two sizes to fit the 12 inch iPad Pro as well as the 9.7 inch iPad Pro. It uses the Smart Connector, which means no need for Bluetooth pairing or separate charging. Just set your iPad Pro into typing position and you are ready to go. Logitech latest K375s Multi-Device Wireless Keyboard and Stand Combo is a nice, affordable duo for your desktop. Logitech of late has been churning out devices with multi device pairing solutions, to cater to a new generation of millenials who use and respond on multiple devices. Isn’t it more convenient to use a full size keyboard to update your bosses via Whatsapp? If you are looking to buy a cool wireless gaming headset for Christmas, you might just want to wait a little longer.